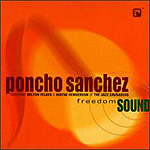 Poncho Sanchez's brand of salsa has always been built around a driving attack; a Maynard Ferguson-meets-Cal Tjader mentality. The Jazz Crusaders were precursors of the "light jazz" of the mid-'80s; while not artistically vapid the way a Kenny G or Bob James is, they were still much more into a pop-oriented smooth groove than most jazz purists were comfortable with. Combining those two approaches is certainly not impossible  witness the success in the late '40s of Desi Arnaz's smooth Latin big band  but it just doesn't work on Sanchez's new album, "Freedom Sound," where the master congero's normally sizzling band is joined by former Jazz Crusaders Wilton Felder and Wayne Henderson. Part of the feelings of disappointment may, to be fair to the musicians, simply be due to listener expectations. Sanchez's track record is such that when one familiar with his work pops a new release into the CD player, a light jazz shuffle is not what is anticipated. This isn't a bad album overall; it just doesn't seem to hold up well when compared to other Sanchez outings. You could do worse with that $16 this will set you back  but you could do a whole lot better by getting one of his other Concord recordings.